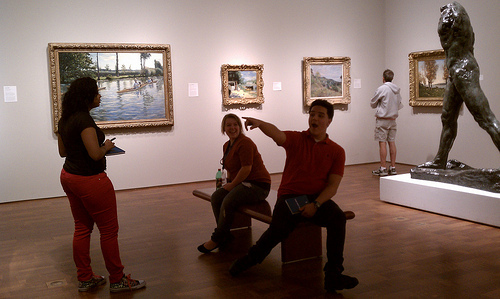 Satellite students thrilled by the Impressionism gallery. In mid-December, the Satellite High School class came to a close. After fourteen weeks of gallery time, sketching, and even the occasional field trip, our class culminated with a big event: the final project. 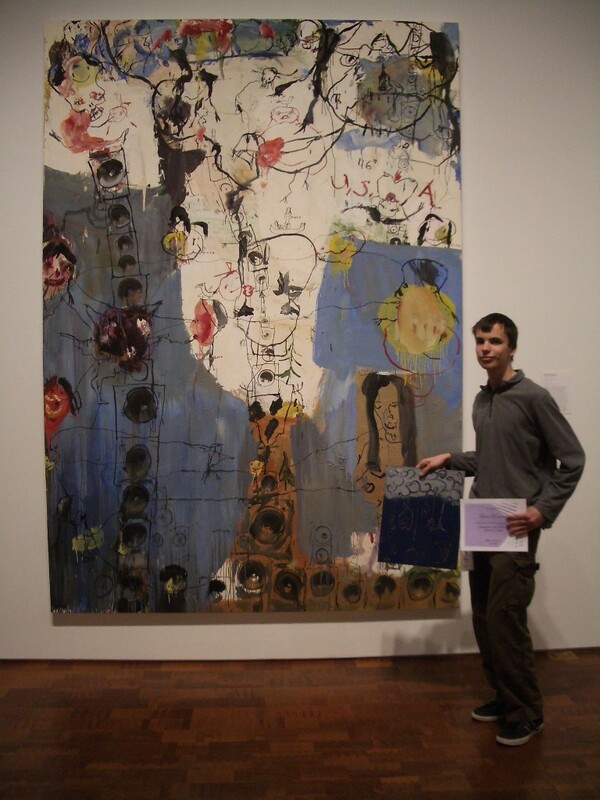 Students chose one work of art–any work of art–in the entire Museum Collection to research, write a sample gallery label, and create their own artwork in response to it. Then, on December 15, they gave us a short presentation about what they discovered and what they created. Naturally the results were pretty incredible, showing how much the students thought about their chosen artwork and how they challenged both themselves and the concepts of the artist they selected. Continuing the blog’s unofficial theme this week of student work I’m thrilled to share some highlights of the Satellite students’ final projects with you! Desha B. with her response in front of her chosen work: Kehinde Wiley, St. Dionysus, 2006. Gift of the African American Art Alliance in honor of their 15th Anniversary, with additional support from Valerie A. Childrey, MD, and Sande Robinson. 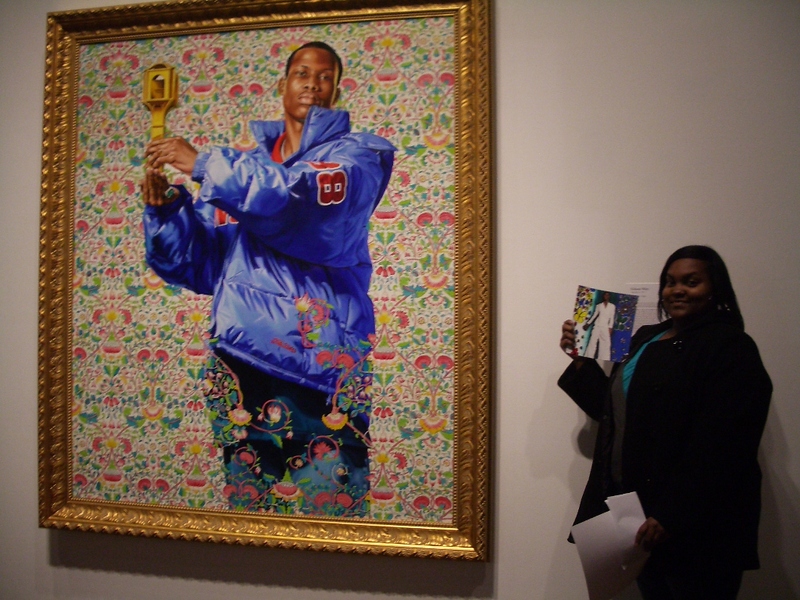 Desha B., above, chose Kehinde Wiley’s monumental oil painting St. Dionysus. Her response, above, played with stereotypes, too: her mixed media collage took an idealized woman from a magazine and placed her in a backdrop of Wiley-esque flowers. You can see a larger image of her work right here. Marco’s artwork has a gritty, sketchy style, so I was not surprised when he chose Brad Kahlhamer’s large-scale, graffiti-like painting. Marco’s painting of caged birds etched into acrylic paint riffs off of Kahlhamer. 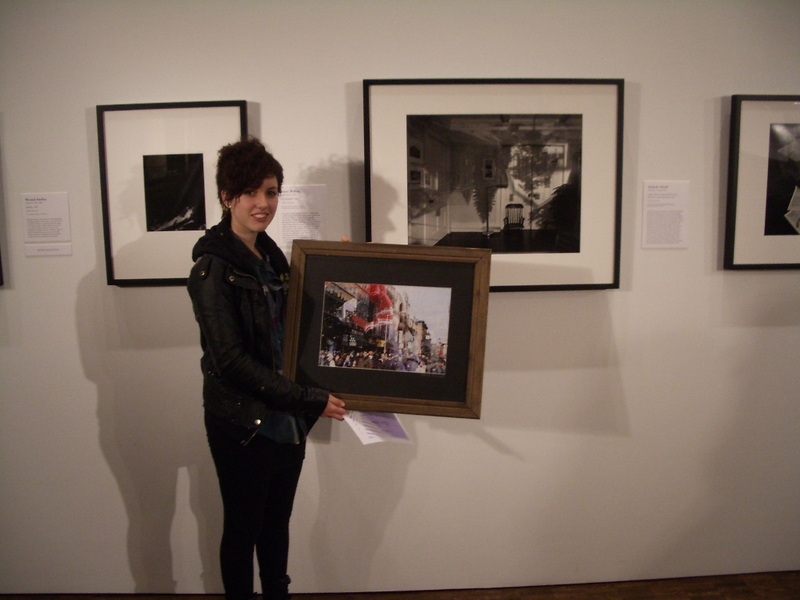 Anna M. in front of Abelardo Moreli, Obscure Image of Houses Across the Street in our Living Room, on the Museum's mezzanine level. Anna M. found inspiration in the play of shadows and double-exposure in Moreli’s photograph. She shared with us that she’d originally dismissed the photograph she took on Chinese New Year in New York City’s Chinatown as a mistake, but eventually was drawn to her own double exposure as well. You can see all of the Satellite final projects at our Flickr page–you’ll find Tony H.’s urban take on Vianden, Erin M.’s industrial lion inspired by Arnaldo Pomodoro’s Sphere No. 5, and many more. After the presentations, we headed into the Kohl’s Studio to celebrate with some home-baked cookies (by yours truly, of course, and sprinkled with some edible gold stars–cheesy, but apt!). I gave the students a gift of art postcards from Europe, with the homework assignment to one day travel to see those pieces in person. In return, the students gave me the best gift an educator can probably ever get. As things wound down and they prepared to leave, one student asked, “I know technically the class is over, but can you do this again next semester a few times?” To which every single student in the room loudly agreed. How could I say no to that? So although their projects have been turned in, the class isn’t over–they’ll be back, and I’ll be sure to post about it here. This entry was posted in Education and tagged Satellite High School Program. Bookmark the permalink.